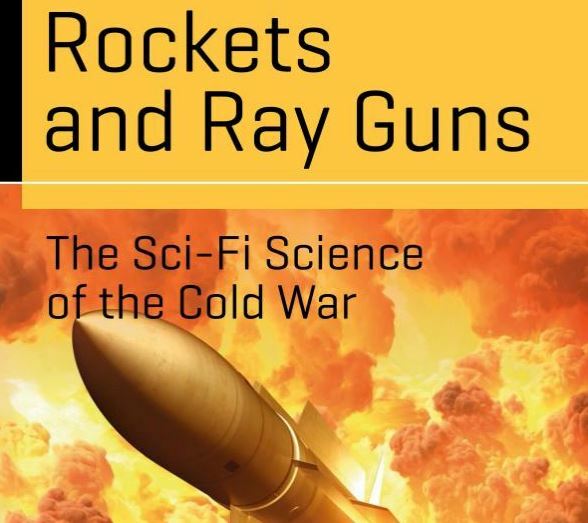 'Rockets and Ray Guns: The Sci-Fi Science of the Cold War' — a review – AiPT! Imagination is the root of both invention and fantasy. The imaginative process is used to explore what is possible within the bounds of reality, and used to create new worlds and concepts without being restricted by reality. Andrew May’s intriguing new book, Rockets and Ray Guns: The Sci-Fi Science of the Cold War, explores the intersection of invention and fantasy — in this case, within the realm of science fiction — as it existed during one of the most productive time periods for both endeavors: the Cold War. The political, social, philosophic, and economic rivalry between the United States and the Soviet Union split the developed world and fueled the expansion of technology by both sides through a kind of “creative intimidation” and one-upmanship that spanned nearly half of the 20th century. Concurrently, the SF genre enjoyed one of its most robust periods, especially during the early parts of the Cold War, which is known today as the Golden Age of Science Fiction. May visits several of the Cold War’s most notable scientific developments and concepts, starting with the era’s most defining technology, the atomic bomb. Writers from the Pulp and Golden Ages of science fiction actually predicted atomic and nuclear weapons with a striking degree of accuracy, owing in part to extrapolation from existing scientific knowledge that predominated stories from that time period. From there, the reader is invited to explore space travel, computers, and several SF tropes that never panned out in the real world, from aliens to mutants, and the aftermath of a full nuclear exchange. It becomes obvious rather quickly that there’s no absolute trend when it came to SF’s powers of prediction. While stories about weapons of immense power and of rockets enabling space travel ultimately found great corollaries in the Manhattan Project and the Space Race, SF notably overlooked the importance of several developments, failing in one major case to recognize the importance of a contemporary invention that would go on to shape our world as few recent creations have: the transistor, the harbinger of miniaturization. Aside from the aforementioned aliens and mutants, SF’s greatest misfires were less a symptom of scientific inaccuracy and more a function of the frequent unpredictability of politics. The presumption that space travel and landing on the Moon would immediately bring about colonization was dashed more by political priorities than by technological implausibility. The failure of space combat as dreamt of in the pages of science fiction owes more to restrictions agreed to by the major powers than by a lack of realistic potential for things like orbital weapons platforms or laser defense systems. Thankfully, the lack of an all-out nuclear conflagration also rendered SF’s horrifying predictions of post-war conditions untested as well. Even the ultimate peaceful ending of the Cold War was something the pages of science fiction were unable to predict. The real message of Rockets and Ray Guns seems less about separating what worked from what didn’t, or what made sense from what was pure fantasy, and more about the interplay between reality and fantasy and how imagination allowed both sides to reflect and even influence elements of the other. Scientists, after all, tend to have a higher-than-normal interest in science fiction, as illustrated by an anecdote suggesting legendary SF editor John W. Campbell could have identified the secret location of the Manhattan Project (Oak Ridge, Tennessee) through the abnormal cluster of subscribers to Astounding Science Fiction in its vicinity. One of the book’s more glaring flaws is its lack of balance to both sides of the Cold War; after all, the race between superpowers was hardly one-sided, especially considering that the Soviet Union was the first to develop nuclear power for civil use and registered several firsts in the Space Race among other scientific breakthroughs. Nearly every work of science fiction referenced came from the United States, and that which was not from the US was at least from the West (Karol Čapek, the 1920 originator of the term “robot” who hailed from pre-war Czechoslovakia, is the lone exception). Much of this lack of balance is probably due to a lack of source material from Russia and the rest of the communist bloc, whether from a paucity of available translated writings from the time period, the general censorship of the written word that dominated these cultures, or both, but this discrepancy is never really addressed. For what Rockets and Ray Guns does represent, however, it does so with an impressive amount of detail, including primary source illustrations from science and SF origins alike. If you have a basic understanding of physics, you’ll better understand discussions on real-world technologies (both successful and failed), but the language never becomes so unwieldy that amateurs would become lost. If you’re well-versed in science fiction, the real history will serve as an outstanding balance. That’s really what May has created — a work that will delight science, history, and SF buffs alike.